From its distinctive look to class-leading performance, we have stopped at nothing to create the new standard in heavy duty scooters. The Cobra GT4 boasts a dynamic, modern design and incorporates cutting edge technological advancements to provide the most attractive, highest performance scooter available. In addition, the Cobra provides maximum comfort with a smooth, stable ride and a deluxe Captain’s Seat with a width of 22″. Experience a new age in scooter design with the Cobra GT4. 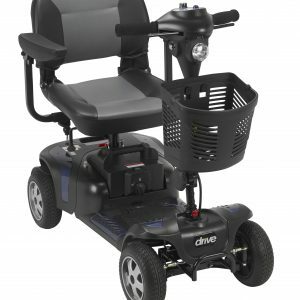 Be the first to review “Cobra GT4 Heavy Duty Power Mobility Scooter, 22″ Seat” Click here to cancel reply.